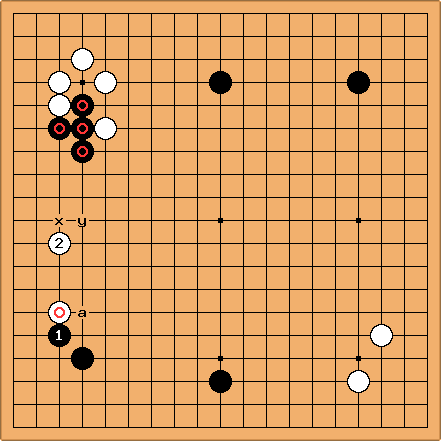 Is a good forcing move? Charles is good: but the question then is, was the / exchange before it good for Black? I'd say no. Now White at b is easy to play. 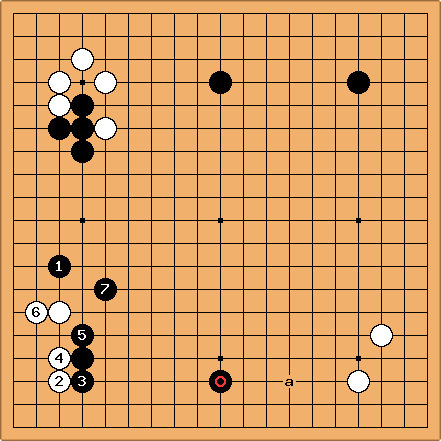 Without that, White had a problem settling here. See for example 4-4 point low approach, diagonal contact then pincer for discussion in a similar position. Does White have a better option than ? If White plays here, Black might answer at a, which is very good for him locally. But the stones will come under attack. Thae are a heavy burden now and it might be too big to sacrifice them. By the way: at x with similar ideas has to be considered too. Charles at y looks better, again. But is this the right idea for White? isn't very good. White could end up trying to win the game only with territory in the upper left and bottom right corners. Bill: If , I would play Wy in a shot. Then are heavy while is light. SnotNose: If it is agreed upon that is a point that both players want, why doesn't Black play there straight away? It is an extension and a pincer and it solves the problem of Black's heavy stones. , good or bad, is not urgent and misses the key point. Also, if White's lower-left approach move was played after the sequence in the upper left, perhaps it too should have been at . 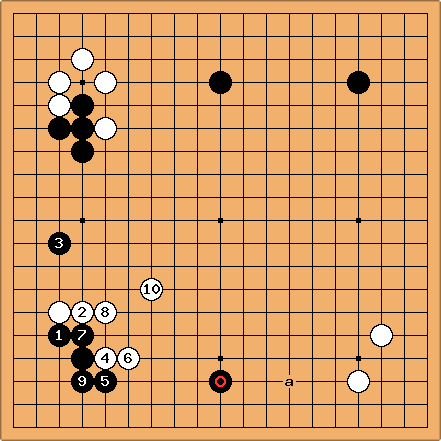 That is, both players missed a chance to take the key point by playing in a nearby, but less urgent, area. How does this sequence relate to the global position, especially to ? The most usual approach in this situation is a pincer at 1. For his reply, White has a lot of choices. Let's just look at invading with 2. The moves through 7 look natural.